Photos: Arabella Cecil Fate has smiled on the Yagua, for the geography of their surroundings has allowed them to lead a charmed existence. Numbering some 3,900 and spread over 30 communities, their territory lies in the Loreto region near Iquitos, north of that of the Shipibo Indians. In stark contrast to these Amazonian cousins, the Yagua have been spared the perils of guerrilla conflict, drug trafficking and oil exploration. The Yagua community, so mentioned in this piece, lies on the Peruvian-Colombian border, just a few miles upstream from the Brazilian port of Tabatinga. In the rainy season, or at the start of the dry season, when it is still easy to navigate these upper reaches of the Amazon in an outboard-powered boat, the village is just an hour or so from the settlement of Leticia in Colombia. Numbering just six, the founders of the village moved out here some 30 years ago. Today the community has grown to 160. When we wryly asked how they grew so quickly, they replied, without batting an eyelid, "Well, we're rather like rabbits..."! The good trade they have going in jewellry, hammocks, musical instruments as well as even hand-crafted weapons, provides villagers with the much-needed hard currency for buying medical supplies and other essentials. Unfortunately tourism also has its disadvantages. For instance, the villagers also use this cash brought by visitors to buy staple ingredients like flour and sugar, meaning that they no longer grow crops that need harvesting, such as wheat, sugar cane and maize. However, at least the Yagua have not turned into alcoholics like so many other tribes; that doesn't mean to say though, that they are abstemious! They produce an alcoholic beverage called Masato, made by chewing and fermenting the root of the yucca plant, which goes down in copious amounts very well at parties! 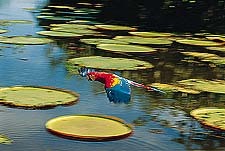 Much of the Yagua's heritage is retained in everyday life. When fishing for piraña or other native fish, they still use hooks and lines, tridents and spears. The adults in the tribe still hunt monkey, sloths (the Yagua name for which - mico perezoso - literally means lazy monkey) and the world's largest rodent, the capyvara, as well as wild fowl. They use traditional weapons: bows and arrows and blowpipes (Cerbatana). Sadly skill with the blowpipe diminishes with each passing generation. The ancient knowledge of making curare, the lethal poison used by Amazonian indians to coat the tips of the darts they fire from their blowpipes, is still applied by the village elders. The poison is made by boiling up the dozens of plants and roots that make up the ingredients until a velvet-black juice is left in the bottom of the pot. The fast-acting poison causes paralysis, rendering the victim's lungs useless and bringing about death by suffocation in a matter of minutes. The Yagua still rely a good deal on the jungle for their clothing and shelter, as well as for the fruit that makes up the bulk of their diet. The women wear simple skirts of red cloth purchased at one of the markets downstream. The men's grass skirts and their small palm-leaf headdresses are made entirely from nature's own materials. The only coloring the Yagua use is the bright crimson juice of the achiote berry, which they apply liberally to dye their skin, grass skirts and palm headdresses. The Yagua enjoy a remarkably harmonious and balanced existence. However, for it to last they may have to be shielded from external disruptions such as oil explorations. Bitter experience in other parts of the Amazon suggests there would be no surer way of upsetting this delicate balance.